This is a second essay from Dr. Michael Dolzani’s graphic novel class at Baldwin Wallace University which read Lisa’s Story last Fall. It’s by Lydia Herpy who thoughtfully distills the essence of what I was going for in the work. I appreciate her allowing me to share her essay, and, once again, want to thank Dr. Dolzani for selecting Lisa’s Story to study in his class. The illo that accompanies this essay is another unused cover idea for the book. 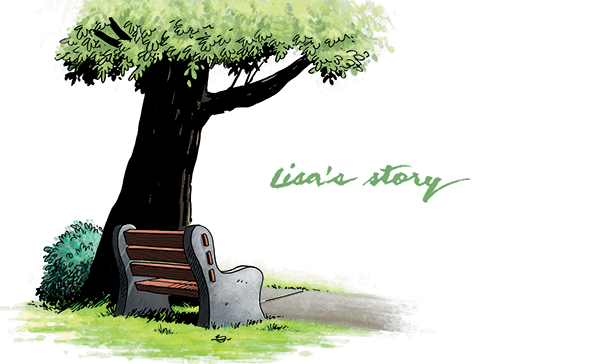 In Tom Batiuk’s graphic novel, Lisa’s Story, he shares the story of the character Lisa Moore. Although the character has grown up in Batiuk’s work, the part of her life that fills the pages of the novel consists of her coping with the reality of living with breast cancer along with the acceptance of the inevitability of her death due to the illness. However, there is more that meets the eye in a story that ends in the main character’s death. Batiuk expresses the beauty of the cycle of life through the power of love. The journey then begins when Lisa finds out that she has a malignant tumor in one of her breasts. From the beginning of this emotional journey of Lisa’s illness, the reader sees her husband Les close to her side. Les became a large help to the stability of Lisa’s mental health as she made strides in the hopes of curing the illness that fell upon her. Shortly after learning the state of her body, Lisa encounters a familiar face—that of Holly Budd. Holly is a former classmate of Lisa’s and the wife of Funky Winkerbean, the co-owner of Montoni’s Pizza. She becomes a major part of Lisa’s support group throughout her day to day life of living with breast cancer. The underlying message of this story roots in the relationships one makes in their lifetime. Although death is inevitable, the connections we make and the love that grows from those connections make the struggles of life worthwhile when it all comes to an end. Holly Budd empathizes with Lisa, sharing the thoughts she had during her struggle with breast cancer. During their first encounter in the novel, Lisa begins to cry when thinking of the major changes and risks she will have to endure while fighting breast cancer. Holly lifts her up, saying, “I felt exactly the same way when I was diagnosed with breast cancer… look, we go way back and can share things… as friends…” (16). A strong friendship begins to bloom, making a more powerful foundation of support for Lisa that gives her the motivation, courage, and energy to face each day. Times are rough between Lisa and Les, but that does not deter him from trying to keep reality a pleasant place for both himself and Lisa to be present. He usually manages to bring a smile to her face with his sense of humor and down to earth spirit. As the chemotherapy process begins though, that smile isn’t always so easy to earn. When Les can’t help Lisa as much as he can, however, friends and family never fail to stop by and help in any way they can. The support group begins to grow into a vast amount of faces, making even the smallest of gestures impactful in allowing Lisa to feel comfortable. The reader is introduced to Cindy Summers, former wife of Funky Winkerbean, when she stops by Lisa’s home after being told that Lisa wasn’t feeling up for a day’s work. She encourages her to start wearing a wig to boost her confidence and allow her to feel normal again. Lisa tells Les, “Cindy took me shopping… she said a new look would give me a new outlook… and you know what? It worked!” (52). Along with this, Holly Budd introduces Lisa to a support group for breast cancer patients and survivors. When backing away from the focus of the story, the reader begins to see that every close friend and loved one in Lisa’s life brings their own kind of support; each of these helping hands serving Lisa in their own individual way. After being in remission for seven years, Lisa gets a call from the doctor who requests that she returns to the hospital for more tests. After completing them, she anticipates the results while leaving for vacation with her husband. She receives the news that the cancer has returned and began to spread throughout her body. Once more, Lisa is faced with bad news. Holly and Les bring her to her chemotherapy sessions, not leaving her without support. While Lisa’s battle for cancer goes on, the reader meets the character of Darin. Darin is the baby Lisa had in high school, but decided to give up because she was too young to care for a child. Knowing her time is coming to a close, she expresses to Les that she would like to let her identity be known to her child who she never got to know. All the while, Darin is searching for his birthmother after his girlfriend Jess suggests he meet his real parents. Although the relationship between Darin and Lisa doesn’t get to fully develop in the story, this part of the story speaks true to the purpose of the story—love and its powers. Lisa created a life that she wanted to meet before she lost her own. Darin and Lisa are brought together, bringing Lisa a sense of relief and joy even during the darkest times of her life. I found love in even the most unsuspecting places in this novel. During the trip Lisa takes with Les to the Grand Canyon, they meet a man David and his daughter Natane who traveled there to take her graduation photos. They met after David told Les to warn Lisa not grab onto the branches on the canyon. After David told the couple that they didn’t have their camera with them, Les offered his while Lisa fixed Natane’s hair. After the photos are taken, Lisa’s hat blows off with the wind, leaving her bald head exposed. She is pictured with an insecure and sad face, which draws David’s attention. He offers her kind words, “Live with hope,” (119). Throughout this novel, the connections Lisa has with other people is noticeably the main focus. Including the strangers she meets along the way. During one of Lisa’s chemotherapy treatments, she is sat next to an older gentleman who sparks up a lighthearted conversation about cancer. He brings a sense of humor to the unfortunate event of being diagnosed with cancer, “Cryogenics. I’m going to have myself frozen just like Ted Williams. Cryogenics is how you beat this cancer thing. You have yourself turned into a corpsicle so you can be thawed out when they find a cure” (100). Lisa and the man are both pictured smiling next to one another, sharing a moment of joy. After Lisa finds out that she only has a few months to live, she chooses to stop the chemo treatments in order to better enjoy the remainder of her time. It doesn’t take long, however, before her body begins to give out on her, and she calls the hospice to send a team to her home to care for her more closely as her body begins to need more and more rest. A set of three panels stood out to me in the time of her beginning to sleep in a hospital bed with monitors. We see a medical professional speaking with Les about Lisa’s body, “Lisa’s systems are beginning to slowly shut down and the cancer spreads through her body. Our main job is to try to keep her pain free” (212). Les responds, “From your experience, what’s the last thing to go?” (212). In the last panel Les and the nurse are both looking back at Lisa lying on her hospital bed, and the nurse says, “Love” (212). After Lisa’s passing, a walk is held in her name, “Lisa’s Legacy, Making Strides Against Cancer.” Pictured are all of the faces that filled her support group. The walk is held in her favorite park where a bench is now dedicated to her. This novel celebrates love in a unique way. Death will always be a sad subject, but when you honor the life that was once there, it is easy to understand that it is all worth it. When looking at the panels of the novel, the reader is not left feeling isolated and sad. Instead, Batiuk emphasizes the feeling of having company. There is a sense of warmth in nearly every image even in the places that may remind you of the state of Lisa’s health. This novel celebrates life and love even when it seems that its main focus is that of death. It brings light to the topic of death, allowing the reader to view it from a new perspective—from a more accepting view. In the end, we see that Lisa lives on through the love from her husband, children and the people who were a part of her life.